As promised I mentioned in my post on the Blogger Festival that I will be having a closer look at some of the other products I received in my goody bag or from the various sections in the blogger festival.... If you'd like to see that post you can find it Here! So the blogger festival had some products that I have heard about and some of them I have never knew existed, I'm doing a review on some of them at the moment so you will see my honest thoughts on them, but if you want me to try out something you've seen here or you want my opinion on it, just leave a message in the comments or pop me an email. First I have to say that this subscription is so cool, I have never heard of a razor subscription before and I have looked at a lot of subscriptions whether it is food, makeup and even drinks. So basically FFS( Friction Free Shaving) states they are on a mission to make it cleaner, easier and cheaper for you to shave your legs, underarms and any other areas. typo £3.00 a month (I spend more than that on sweets/ makeup in a week.). This is such a bargain and on top of that they have such a cute rose gold handle one, its so "instagramable" that I was practically drooling over it. All there razors are named also there's Faye, Frankie, Samantha( the golden goddess). Oh my word, 7th Heaven deserves a massive shout out, they were so generous at the blogger festival I was astonished. I'm a big 7th Heavens fan I Loveeee their face mask, I cant wait to have my 7th Heaven pamper party its gonna be amazing!!!. I kept saying to the lovely lady at the festival I'm gonna share these with my girls I cant keep this goodness to myself. Also there range now compared to what it was before is crazy, they not only have face mask, they have hand mask and feet mask. I know they sell in different stores but I usually purchase there masks at Superdrug. Natural world is a hair care range that produces natural and organic products and I am a big fan of anything that is natural or organic so I was very excited to have a sample of their coconut water hydration and shine weightless hair oil. Their range brings natural ingredients from all over the world to create naturally affordable hair care. Their range includes Argan Oil of Morocco, Brazillian Keratin, Caffeine Power, Chia Seed Oil, Coconut Oil and Macadamia Oil. All of the different ranges I have listed come with their own targeted function. I will be posting my thoughts about the sample on my Instagram but what I have done I have taken the quiz and it has let me know the best range that is suitable for me so I will be trying the whole range for a few weeks and giving you my honest feedback on what I think. See if you can guess the range that the quiz picked, leave a comment below. In fact if you would like to take the quiz or check them out just Click Here. Two words " Rose Gold" PNY has saved me this winter and they have saved me in style, because my Iphone dies all the time and if you have an iphone you would know that the battery life is even worst when it gets cold. The lady's at the festival was so lovely and they not only had power pack's on display they had lenses for your phone, charger cables, usb sticks,memory cards and the list continues. I love a bit of tech especially tech that makes your life easier, there is something for everyone on PNY you gotta check them out. Beverly Hills Formula another brand I have seen but haven't tried yet was showcasing there brand of toothpastes, I received a goody bag with a large tube and some samples plus another large tube was in the goody bag I received when leaving, so I left a happy camper. I can appreciate teeth whitening because I am a coffee drinker and even if you don't drink coffee the food we eat also stains our teeth. I found their perfect white black quite intriguing and I cant wait to try that. I will definitely be giving you some feedback on whether I see an improvement in my teeth. I am so happy that they were at the blogger festival because I have always seen them in Superdrug but I never had the guts to try them I am a die hard Colgate and Oral B fan so I can wait to try this product. Aflorex is a food supplement with precision biotics. Its a natural product and it helps to protect your digestive system from harmful bacteria as well as improve the health of your gut and they've stated on their website that this product is safe with no side affects. There's a whole lot of testimonials on this product in terms of the product helping them with bloating,gastroenteritis, IBS you should check them out Testimonials. Aflorex promises to help you reclaim your freedom to travel, eat out and enjoy life. I cant wait to try this product and do a review on it, I have never heard of Heaven by Deborah Mitchell. Heaven is a skin care rang. There packaging and brand looks amazing and I have to admit some of the products are pretty high-end so I am grateful to this company for the opportunity to try their products and do a review. I will be doing a review on the peppermint clarifying hydrogel because I have dry skin especially in the winter months. They have a wide range of products from anti-aging, acne prone skin,damaged skin, a men's range, cleansers, moisturisers, professional kits. In fact I've seen a few of there other products that I plan to purchase so I can try them out after I review this product.If you'd like to see the rest of their range you can find them Here!. To add the website gave me options for a range of different countries so you will be able to purchase even if your not in the UK. Another product I've never heard about is Merumaya, they produce skincare products and I received a few little samples in my goodie bag. There a bit more high- end than Deborah Mitchell in terms of the entire range so I cant wait to try these samples and add them to my travel bag (their so cute). Their range includes cleaners, moisturiser, night creams and eye creams ect, so if your looking to pamper yourself a bit go check them out Here!. I recieved two jars of Opies cherry's in my goody bag, looking forward to baking something with these, its a family run business and they do jarred products. I spoke about Opies more in my blog post on the full day of the blogger festival and there was more pictures and info on them, you can find that post Here. I've received a deodorant in my goodie bag from So... For Me I've seen this deodorant in every super drug, supermarket, boots ect and here's the shocker I have never tried it, another item I will be adding to my handbag. I received such a variety of healthy drinks some I was familiar with like Zeo and Grace Aloe and some a bit new to me such as Get More Vitamin C and Sparkling Ice. A lot of them were packed with natural ingredients, low sugar and no calories I think these range of drinks will go great when it comes to complimenting a diet if you want to take a break from water and homemade smoothies and juices. Last but certainly not least out of all the item's I received in my goody bag this was my absolute favourite #Screams I cant find the words. To be honest when I saw the dark chocolate on the packet I judged it right away because I'm not a fan of dark chocolate but I'm obsessed with sea salted caramel. I was convinced that the dark chocolate would have put me off but when I tasted this bar I was tempted to lick the wrapper it was that good. 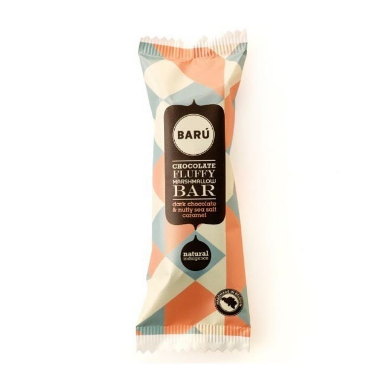 I even wrote to the company to ask them where are their products being sold because I've never come across Baru and I literally said to them that this bar of chocolate is the bomb. Its a chocolate fluffy marshmallow bar with dark chocolate and nutty sea salt caramel. Now I know where I can purchase them I want to try the other items in their range. You can purchase their products at Harvey Nicholls, Waitrose and Delicatessen Shops. All the products in their range can be found Here!. Enjoy! Quick Disclaimer: Some of the american sweets from Go Send did not make it to this blog post but I am grateful to Go Send for their bag filled with American Candy LOL! So I hope you liked today's post.... subscribe to my blog so you wont miss a thing and Leave a comment . Also let me know if you've tried any of the products mentioned in today's post I would love to know your thoughts and opinions. And once again thank you for reading.